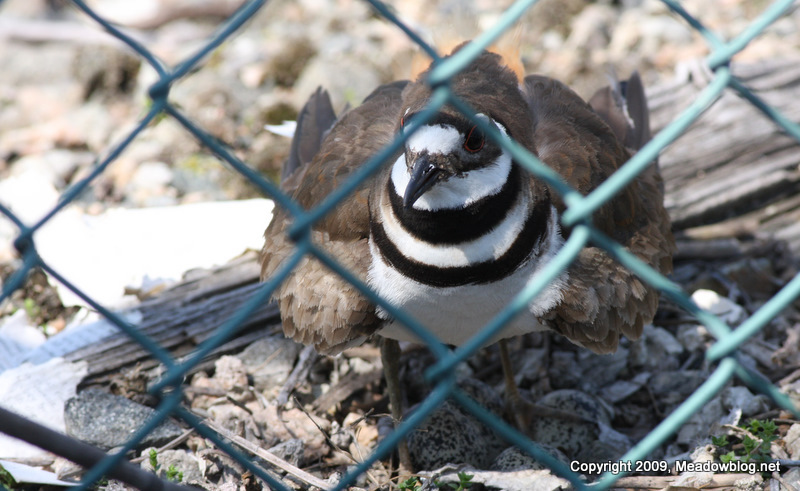 We passed through a North Arlington construction site on the way to check on the progress of a new Osprey nest, and the workers pointed out this Killdeer guarding her nest, right next to a chainlink fence. The nest was just a few feet from a narrow roadway choc k-a-block with construction vehicles and machinery. The noise was non-stop, but the Killdeer did not seem to mind. 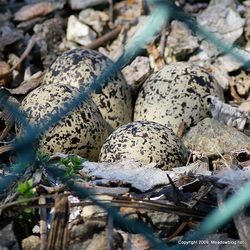 When a construction worker approached the nest, the Killdeer scurried away, making that high-pitched whir they like to make. We looked at the ground where the Killdeer had been, and discovered four well-hidden eggs. when we came back the next day, we couldn't find them though they were no doubt in view. 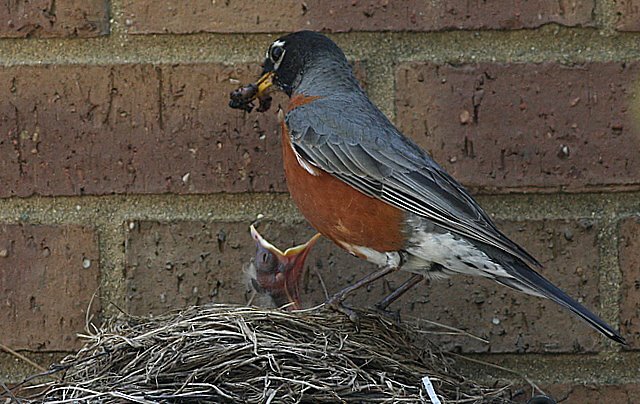 One thing about American Robins — they don't seem to mind making their nests in the middle of things. This robin built her nest atop a light fixture above the entrance to the Meadowlands Environment Center, and don't seem to mind all the visitors walking back and forth under their apartment. She and Pops have been feeding their young — we've seen at least two — like clockwork. More on America Robins here. The Meadowlands is looking more and more like an avian maternity ward. Stay tuned for some nifty news. We did this very short (34-second) video for tonight’s talk at the Kearny Library. We made the video a week or two ago at the Gunnell Oval. The water segment was videoed at the nearby Kearny Marsh. We don’t see American Coots out of water too often, but there they were — walking around by the ballfield, acting almost like chickens. These red-eyed little birds are often mistaken for ducks, but as you might see from the video, their feet are not webbed. If you scroll down the blog to this week’s Tuesday Teaser, you can see what a coot’s foot looks like and click on a link for more info about these odd birds. Ridgefield, in the northern part of the Meadowlands District, has several nifty attractions, from the restored wetlands of the Skeetkill Creek Marsh to the Monk Parakeets that nest under the highway bridge over the train tracks on Railroad Avenue. 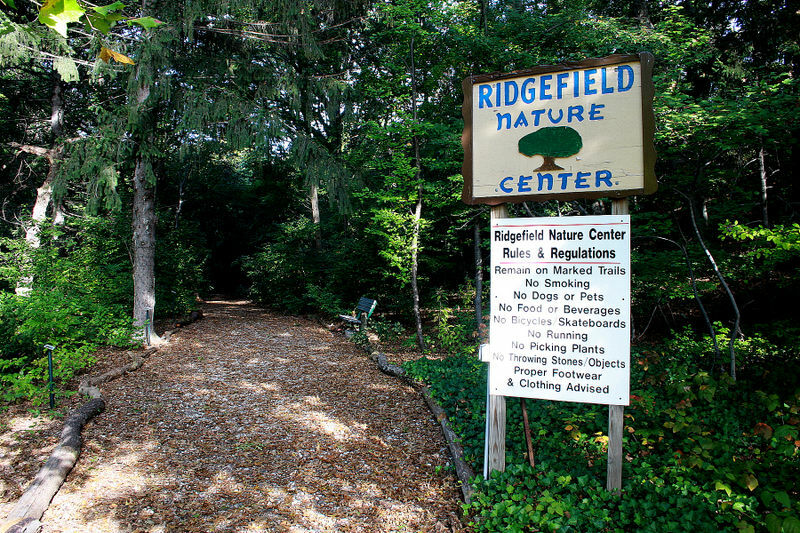 But there's also the Ridgefield Nature Center, a beautiful wooded natural area comprising 5.4 acres off Shaler Boulevard by Ray Avenue. The property was the source of the spring for the Great Bear Spring Water Co. from 1920 to 1975, at which point the land was sold to the Borough of Ridgefield. Since then, the borough has been restoring the site, planting well-labeled native trees and plants and curtailing the invasive species. Those are labeled, too — so you'll know what to look out for in your own backyard and elsewhere. Click "Continue reading…" immediately below for more information on the Ridgefield Nature Center.